It’s a great privilege for me to stand before you today as the Chairman of the Aircrew Association in Cyprus to help commemorate the first military campaign fought entirely by air forces, which has become known as the Battle of Britain. We are the fortunate generation, though I may see some exceptions here today, who have lived our lives successfully without a major conflict such as was faced by our parents and their parents before them in two major world wars. There have been minor ones since, of course, from which no doubt those involved can look back on with pride. But it’s difficult for many of us nowadays to comprehend the sense of pending doom or foreboding that enveloped public sentiment in that summer of 1940. No one on the allied side had predicted what we now call “Blitzkrieg” could achieve such rapid success. The fall of France, which had numerically superior armed forces and armor to the Germans, had been unthinkable. Suddenly most of Europe was Fascist. Spain was Fascist; Italy was Fascist; France was now Fascist, Germany, Poland, Austria, Norway, Denmark and Czechoslovakia, were all Fascist. Moreover, Russia was a totalitarian communist state under Stalin and Japan was sweeping through China and the Far East in the name of their Emperor Hirohito. The only other democracy of note, the United States of America, was isolationist – unwilling to interfere in yet another European conflict. Indeed, democratic government and the capitalist system seemed weak, economically and politically; under confident and unwilling to stand up against its adversaries for the sake of its very beliefs. Governments hadn’t yet learned that the price of peace, to use a NATO phrase, is – vigilance. In Britain we had no army in the summer of 1940, ill equipped and poorly led most of it had been defeated prior to the evacuation at Dunkirk. The Navy was still in control of home waters but faced a major threat to its traditional supremacy. The only major force in the UK that had invested in modern equipment thanks to the ‘Dowding System’ was the Royal Air Force, with a shield set up around the British Isles of modern fighters and the then new ground to air radar and its communication systems. The Dowding System could process huge amounts of information in a short period of time. It allowed Fighter Command to manage its valuable – and relatively limited – resources, making sure they were directed to the right place at the right height and time, thus alleviating the need to mount expensive combat air patrols. What General Weygand has called The Battle of France is over. The battle of Britain is about to begin. Upon this battle depends the survival of Christian civilisation. Upon it depends our own British life and the long continuity of our institutions and our Empire. The whole fury and might of the enemy must very soon be turned on us. Hitler knows that he will have to break us in this island or lose the war. If we can stand up to him, all Europe may be free and the life of the world may move forward into broad, sunlit uplands. But if we fail, then the whole world, including the United States, including all that we have known and cared for, will sink into the abyss of a new Dark Age made more sinister, and perhaps more protracted, by the lights of a perverted science. Let us therefore brace ourselves to our duties, and so bear ourselves that, if the British Empire and its Commonwealth last for a thousand years, men will still say, “This was their finest hour”. Thus spoke the new Bitish Prime Minister Winston Churchill to the House of Commons. And such was the significance of what we are here to commemorate today. My father was then a bomber pilot and weapons specialist in the Royal Air Force, who commanded an RAF station at Metheringham in Lincs during the later bombing campaign over Germany but he went to Cranwell with men like Douglas Bader. He was also friends with people like: ACM the Earl of Bandon, “Paddy” to his mates, Sir Christopher Foxley Norris, Johnnie Johnson, Teddy Donaldson and others, who all fought in that battle and who later excelled in their careers. Many we also know were less fortunate and gave the ultimate sacrifice. Historically, the Battle of Britain campaign began on 10th July and lasted until 31st Oct 1940. It was to prove the first major German defeat in World War II and a crucial turning point in that long and desperate conflict that caused the deaths of over 50million people, as well as the enormous costs in infrastructure, property and lives. Yet there was little sense of patriotism amongst the pilots at the time. They may have been few in number and lacking combat experience but they were young men determined to do their utmost to stop “Jerry” and thus prove their worth to their Squadrons. Losses were significant on both sides and consequently, there developed an enormous sense of comradeship and loyalty amongst the members of each Squadron, which was to last a lifetime. 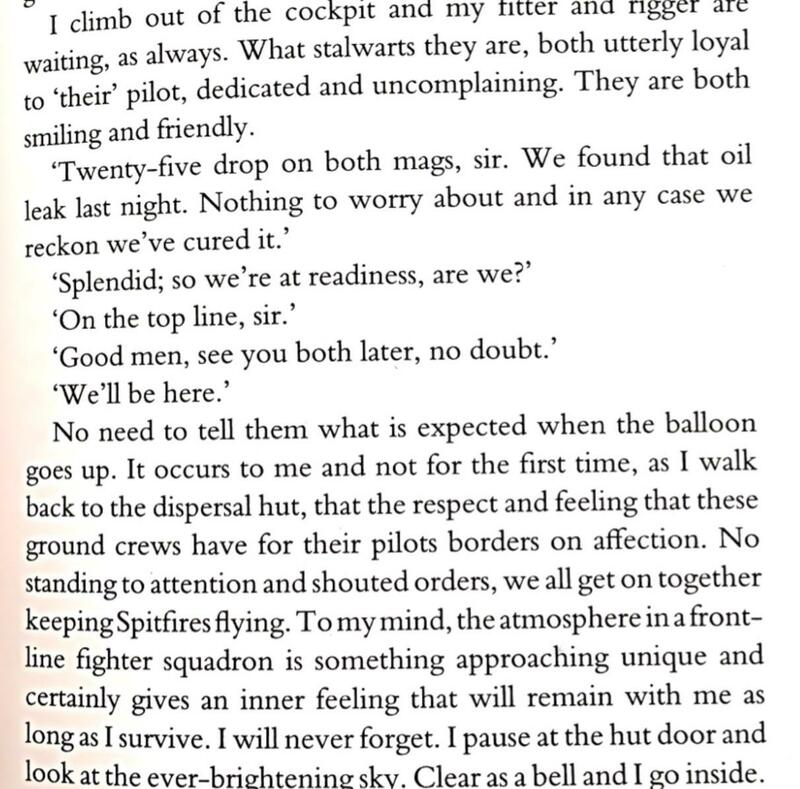 To illustrate this point, I would like to read a short passage from Geoffrey Wellum’s book – First Light. After arriving at the aircraft dispersal area before dawn, he completes his pre flight checks on his Spitfire with the ground crew, which includes an engine start and warm up on the aircraft. It is his first day as an operational pilot on 92 Sqn at RAF Biggin Hill in August 1940. 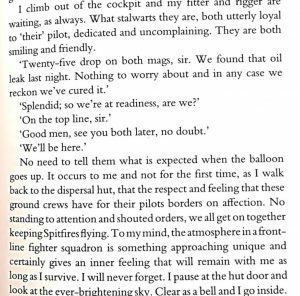 Moreover, the Sqns were fighting over home soil and thanks to the speed and accuracy of the information that flowed to the pilots in the air, they were able to deliver a constant barrage of fire that was deadly, when directed into to the German formations. Whereas, the German fighters, who operated a random system when trying to intercept raids, often returned home without seeing any aircraft at all. Thus RAF fighters were as effective as two or more Luftwaffe fighters, which greatly offset or overturned, the disparity in actual numbers. Furthermore, Fighters are more effective, when allowed to operate freely in loose formations of four that can offer each pilot mutual support while maneuvering as a cohesive unit, rather than the close vic formations, where only the leader is free to look around him but which has been favoured by many movie makers. Strangely the German fighter pilots adopted this method initially but were ordered into close vic formations by Goering, who falsely thought it would help protect his bombers. The R.A.F. began the battle with close formations but quickly adopted the German system for maneuvering. This finger 4 formation offered much greater flexibility and the ability for each member to lookout all around him nearly all of the time and thus watching the rear of the opposite pair for intruders. Certainly in those days, when engaged in air to air combat, whoever saw the enemy first often obtained a tactical advantage over their opponent during an interception. Height, which represented extra ‘energy’, and good use of the sun often proved decisive. I am not going into the numbers game today but it soon became a war of attrition amongst the participants of both sides. Although Fighter Command suffered heavy losses and was often outnumbered during actual engagements, the British out produced the Germans and maintained a level of aircraft production that helped them withstand their losses. The Luftwaffe meanwhile suffered from constant supply problems, largely as a result of underachievement in aircraft production. Indeed their losses would later adversely affect the eastern campaign against the Soviets. Ultimate victory in the Battle of Britain came thanks to a superior equipment package together with its supply train, training replacement aircrew from Europe and the Commonwealth as well as home, and later tactics by the RAF with some poor strategic thinking by the Germans. Victory in the Battle of Britain did NOT win the war, but it made winning a possibility for the first time in the longer term. The bogey of invincibility and ideas of German racist supremacy were laid to rest.